Right now, while I am writing this letter to you , the life of a well-known and prominent human rights activist, victim of political violence, repression and torture from Uzbekistan Mutabar Tadjibayeva, is in danger. Mutabar fights against the propaganda of terrorism, violence, radicalism, corruption, money laundering, lies, hypocrisy in the human rights movement. Mutabar Tadjibayeva is the author of the novel "Prisoner of Torture Island", which narrates about cruelty and torture in Uzbekistan. She is one of the most famous and prominent human rights activist, founder and President of the International Association Human Rights "Fiery Hearts Club". She has been nominated for the Nobel Peace Prize in 2005. While being in her her imprisonment in Uzbekistan, Mutabar Tadjibayeva was awarded with the prize for human rights defenders "Martin Ennals". Grandfather of Mutabar Tadjibayeva was exiled to Siberia by Russian occupation forces in 1937 as "an enemy state and people" with all his family. For Her he became a symbol to be followed in her fight against injustice. During the Andijan uprising and tragedy followed by massacre of innocent civilians in 2005 in Uzbekistan, when people gathered in the main square of the city with their demands of justice, Mutabar Tadjibayeva was put under house arrest without any explanations, and two armed police officers were put on duty in front of her house. Nevertheless, Mutabar managed to set up communication with people on the main square and international Media and Journalists. As a results, Uzbek authorities transferred her to prison facilities. In 2005, Uzbek authorities made allegation against Mutabar Tadjibayeva of having direct connection to the Andijan events and imprisoned her for 8 years for criticizing the Regime of Islam Karimov. In that day, in Andijan, government forces opened fire on civilians and killed 500 participants in a peaceful demonstration. Mutabar was raped, tortured and even forcibly sterilised (her uterus was removed). International Community and Civilised World achieved the liberation of Mutabar Tadjibayeva only because of efforts of an assistant to the US Secretary of State for South and Central Asia who visited of Uzbekistan. After her liberation, in connection with the 60th anniversary of the World Declaration of Human Rights the "Fiery Hearts Club", that was founded and headed by Mutabar Tadjibayeva, was awarded with the French Republic's "Freedom, Equality, Brotherhood" prize. In 2009, Mutabar Tadjibayeva was awarded the US State Department's Award for "Women's Courage" and at the same time Tadjibayeva was granted political asylum in France. Now Mutabar is a head of the International Association Human Rights "Fiery Hearts Club" that is registered and operating in Paris, France. Tadjibayeva criticized some representatives of very well-known and international organisations with big influence in Media and Press, whose management was obviously and deliberately deceived by Nadejda Atayeva. Nadejda Atayeva is a fraud and scammer. She fled Uzbekistan after the criminal case for corruption and embezzlement against her and her relatives was opened. The organization created by Atayeva released a film in 2010, and in 2011 a "report" on the Andijan massacre in 2005, based on a fake story, that was a fraud from the very first to the very last statement mentioned in this movie and "report". In the journalist investigation, based on numerous statements of witnesses, many crimes of Atayeva were discovered. For example, Atayeva used to receive receipts from activists for money that she never paid to them. She also demanded a signatures on blank forms from many activists. The arrogance and support of the oligarch Ablyazov, who stole 7 billion dollars in Kazakhstan, allows Atayeva to put pressure on Mutabar today. For some unknown reasons, some of high ranking Human Rights Watch colleagues are actively helping and supporting such a dubious and suspicious person as Nadejda Atayeva. Atayeva sued Mutabar Tadjibayeva in Paris Court for her struggle and disclosure of Atayeva's crimes. Prominent Human Rights Activist Mutabar Tadjibayeva has no money to pay a lawyer's fees to her defender in France and she can't rise any funds to cover Court Expenditures. She lives on a disability pension (allowance). With money from this allowance, Mutabar helps to victims of the regime and political oppression in Uzbekistan. More than 220 prominent activists from Central Asia united to protect Mutabar Tadjibayeva and have created a coalition "For Mutabar Tadjibayeva!". And all of them are ready to appear in the court of Paris with their evidence of Atayeva's crimes and in support of Mutabar. 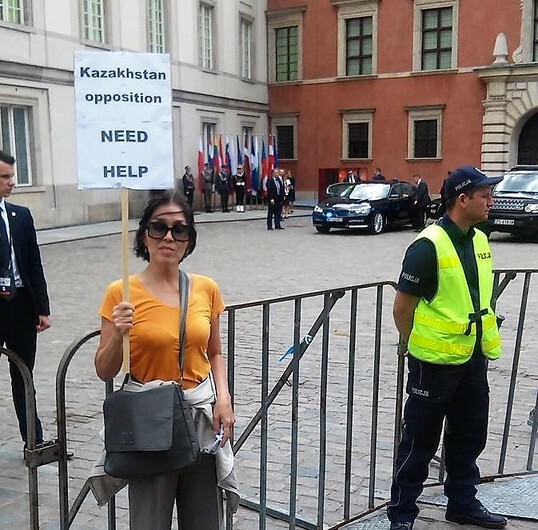 We firmly believe that French Foreign Ministry should demand from Atayeva, her sponsors and patrons the reports on their activities and sources of funding, to conduct inspections with the participation of Mutabar Tadjibayeva and other witnesses who know about the crimes of Atayeva and her "colleagues" in international organizations. We appeal to You for the sake of restoration of Justice and call upon You, the President of the United States and the President of French Republic, human rights defenders and people of goodwill to protect Mutabar Tadjibayeva. "For every Kazakh the door to the motherland is open. We do not put any restrictions"
And I, a citizen of Poland, an ethnic Kazakh woman, decided to return to Kazakhstan, to my homeland to live here permanently. Due to the fact that my mother died, I came to Kazakhstan to say goodbye to her, using the visa-free entry to Expo 2017. Last time I saw my mother in 2005, 12 years ago, and her voice was heard on the phone for the last time. In 2008. It is hurts that for all these years I have not seen or heard my mom because she was the most precious and holy person. You have said at the Convention: "Wherever the Kazakhs live, they have only one historic homeland - it is Kazakhstan. We only have one homeland and this is a great country." Recently, the situation in Kazakhstan has deteriorated drastically. Opposition is being persecute, people are fleeing en masse from the country, freedom of the press is more and more limited, people who dare to speak negatively about the current government are going to jail. Therefore, I decided to go back to Kazakhstan, to my homeland, and to fight for democracy here. My mother died on July 11th, 2017, and I came to Kazakhstan for the funeral by using the visa-free possibility introduced for the time of the Expo 2017. Last time I saw my mom in 2005, 12 years ago, and I heard her voice on the phone for the last time in 2008. Of course, I am sad that all these years the Kazakh authorities were not allowing me to come back to my homeland and that so many years I have not seen my mother. My colleagues from the Kazakh opposition were discouraging me go back, warning me that the danger is a real and that I can even be killed. I am aware of the danger, but as an oppositionist I felt obliged to go back and fight here on the spot. I will try to do everything so that there is no injustice in society, that human rights will be respected in all areas of life. I believe that the government should show people where the public funds are spent. I represent ordinary citizens, so I ask for support from NGOs and ordinary people. Together we will win and change the world for the better, open and diverse place. I actively act against human rights violations and restricted freedom of the press in Kazakhstan. I defend the political prisoners and the oppressed opposition activists. I work with many non-governmental organizations and social and political activists. All my life I am indifferent to injustice and I fight for human rights. I am Kazakh woman, and my father was a participant and one of the founders of the movement “Alasz”, with risking his life he fought for the independence of my country. I turned to the authorities of Kazakhstan to grant me a residence card but did not get any response so far. As a result, I decided to go back to my homeland, Kazakhstan, to fight for democracy. I have been preparing to leave for some time, I wanted to make use of the Expo, during which the visas were abolished - previously the authorities blocked me crossing the border. Unfortunately, due to my mother's death, I decided to expedite my trip to her funeral tomorrow. I last saw Mom in 2005, 12 years ago. The last time I have heard her voice was in 2008. I am the leader of Kazakhstan's opposition abroad, since 2002, I am the President of the Association "Wspolnota Kazachska", a Polish non-governmental "non-profit" organization working to promote and protect freedom and human rights, civil liberties and democracy development.